Things are tightening up at the top once again as those buzzin hornets close the gap to team no limit. In the midfield team raziel leads the way with just a few points separating the top 4 midfield teams as everyone keeps fighting for position. Heading into the summer break team no limit our current points leader extends there lead once again. The buzzin hornets keep getting close but still havent managed to get the over take as team no limit pulls away just before the drs activation zone. From the back of the field we see herkes racing team rise like a phoenix and enter the top 3 arena. Can anyone catch team nolimit???? Or are people just waiting for a dnf. Plenty of racing still to come stay tuned. Wow, Herkes Racing Team must have scored 170 for that race! That's about 7/10 in exactly the right spots. Super impressive for a pretty mixed-up race! Team no limit comes back from the break refreshed and maintains its lead up top followed by team buzzin hornets. Suuuuuuuper late league joiner team jenson understeer bumps herkes racing out of the top 3. The rest of the field has pretty much stayed the same with every team closely grouped together and very few points separating the teams in there respective positions. After a thrilling qualifying and a quiet race at monza. we have a new points leader team Buzzin Hornets is proving to be a constant threat to team No limit. The mid field has a bit of a shuffle as a few teams drop down the order. Congrats to our new points leader. I knew that buzzin' noise in my ears had been getting louder. I thought for sure I was safe with that result, but hats off to my rivals, the Buzzin' Hornets - they pulled one out of the bag that time. We'll just have to get them back in Singapore! At the same time I'm breathing down the neck of no. 1 in the USA, so that's also going to be my unofficial goal for Singapore. A good week from me, lets hope I can maintain the lead! Ah, at last I see the face of my enemy! I'm #2 in the USA and #25 globally, so indeed everyone else shouldn't feel too bad. By my count I scored 7 points for that race, so this won't have been very good for my title campaign. Hopefully nobody else got much more than the 20 you'd get for RIC in 2nd place and VET on pole. I can't imagine anyone who was competitive would have predicted much right about this farce! The greatest night race in motor sports did not disappoint with the opening 10sec of the race showing us what happens when you try to stop a charging bull in the rain? Epic chaos.... This was a relatively low scoring rd for most teams. Team Buzzin hornets retains the top spot, we also see team kimiforwdc enter the top 3 once again. The mid field is yet again stacked up with close fights continue up and down the grid. The final Malaysian Gp didn't disappoint with a surprising upset by the baby faced assassin. A strong charge from Vettel and a nice showcase of talent from Vandoorne. (Could this be a sneak peak of whats to come from him??? We shall see......) Meanwhile back on our leader board we see team Buzzin Hornets pulling away from No limit. Kimiforwdc opens up a little breathing room from the rest of the field. Midfield spots 4-9 have a 4pt spread or less from the next closest team. Extremely close, keep up the good work teams. What will japan bring????? Vettel's DNF really screwed me up this time. If he'd finished second (and everyone else moving down a place) I would have got 8 of the 10 drivers in precisely the correct position. As it is, I get Hamilton and Massa, and a whole bunch of 5 pointers. So instead of 190, I get 70. My form feels unfortunately close to Ferrari's of late in this competition! Suzuka brought forth a strong record breaking qualifying performance by the merc's. But the race showed us that the "diva" is still very much vulnerable in race trim as the baby faced assassin was leading the charge and at times looked as another win was within his reach....... Meeeean while, back on our leader board the top 3 remain steady, as team buzzing hornets continues there good form after the midseason break and team no limit's recoops some much needed points but reliability woes continue. The mid field has a bit of a shuffle seeing both project mayhem & kc grand prix move up a few spots. Positions 4-10 are now within 11pts of the next closest team. Will C.O.T.A bring more buzzing hornets strong form or will team no limit have there engine trouble sorted out????? Stay tuned. In a year where the art of racing was clouded with dirty air, a lack luster of wheel to wheel battles and the occasional team call to get out of my way. We found ourselves in aww at the one and only USA race on the calendar. Cota had driver introductions worthy of wwe theatrics and a pre-race stare down between the two top drivers in the current formula. Over taking was the name of the game in cota with numerous exciting moments throughout the race as vettel and Hamilton duked it out on track. Vettel threw everything he had at Hamilton including the kitchen sink but was unable to stop Hamilton from winning his 5th race in the U.S.A!!!! That was a hard one to call, but at least I've made some places on the Buzzin' Hornets. Still all to fight for in the last few races! Meeeeean while back on our leader board we have a real title fight on our hands as both teams Buzzin Hornets and No Limit Excediron Racing are now TIED FOR THE LEAD!!!!!. KimiforWDC now has a 46 pt cushion to the rest of the field. Team Ernie_f1 drops out of the top 10 while kc grand prix gains on project mayhem. Will Buzzin Hornets maintain the lead? will team No Limit Excedrin Racing finally perform the overtake take ??? and can anyone take 3rd from KimiforWDC????? The Brazilian grand prix brought forth yet another great drive through the field. Only this time around it was the newly crowned 4 time champion lewis hamilton. While starting from pit lane put together an impressive drive after a costly unforced error in qualifying. Which also saw his teammate Valtteri Bottas claim his 3rd career pole after an impressive Q3 final lap attempt when he needed it the most but his pole position efforts were short lived as Sebastian Vettel muscled out another lightning start taking the lead into turn 1. He managed the pace well as none of the front runners were able to match him to challenge for the lead outright. We also witnessed yet another Felipe Massa final drive but this time the home town favorite put together a great result battling his former teammate alonso for most of the race and finishing with a well deserved 7th place. 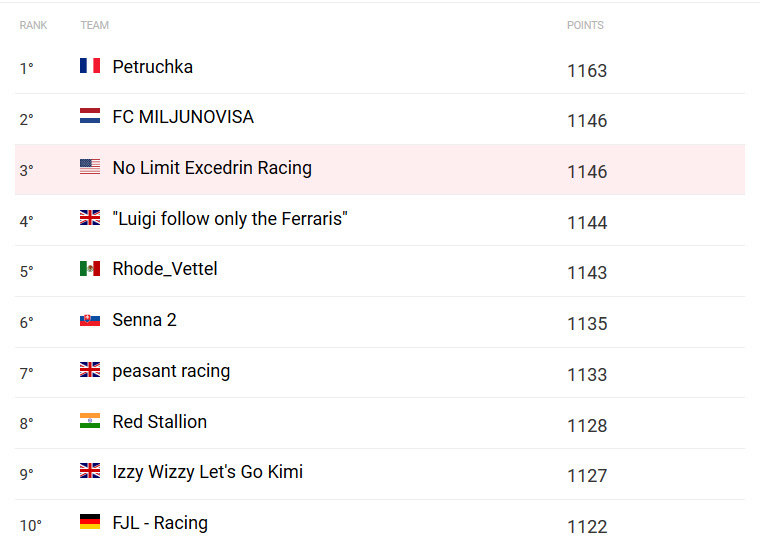 Meeeeean while back on our leaderboard the extremely anxious new points leader team No limit Excedrin racing finally performed the over take on those fierce buzzin hornets and now boast a 18pt lead heading into the FINAL RACE OF THE SEASON. In the mid field project mayhem reels in some much needed points on third place contender kimiforwdc and we see lamo gain 3 spots that round..
Will the buzzin hornets strike once more? Will team no limit gather themselves enough to hold the lead? And can anyone spoil the 3rd place party??? STAY TUNED!!!! Excited for the finish, and I'll make sure not to post anything about results until you've done the write-up! I just check this morning and the scores still arent up. I will post results late tonight. Hopefully the scoring is sorted out today. 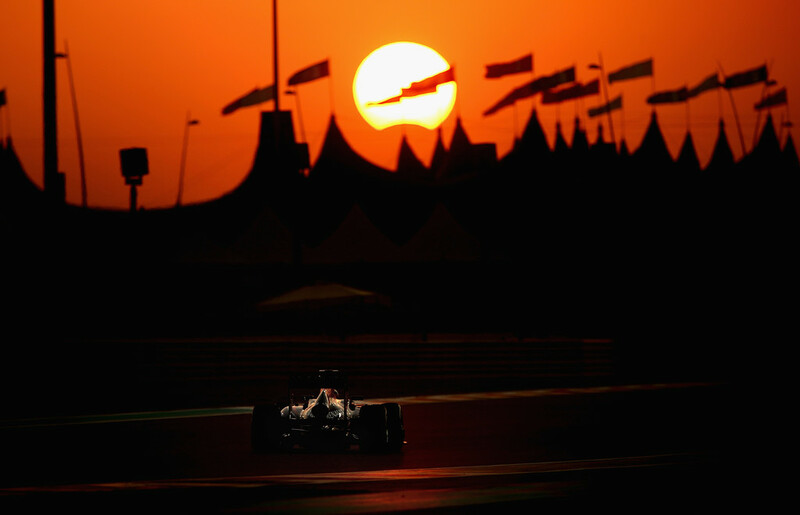 As the sunsets on the yas marina circuit in Abu Dhabi for the final race of the 2017 season we are left to reflect on a year which brought forth new car regulations, a new rivalry at the front that produced a title fight that had us salivating at what could have been an epic fight for an entire season. Going into this year we all wanted to bare witness to a true drag out fight at the front between 2 constructors and this season gave us the 2 best drivers in the sports current era battling it out at every circuit for most of the year. So much so, that many of us had a hard time distinguishing who would come out victorious on any given Sunday. But alas the championship was determined by reliability and some misfortune. Allowing Hamilton to take his 4th world championship. The most excitement of this race came from qualifying as bottas managed to lay down an impressive lap, that in the end the reigning 4x world champ could not match. The grand finale was a bit less anti climatic as the usual suspects were outfront in procession style none the less with Bottas, Hamilton & Vettel staying put from start to finish. Sadly what got the most buzz was the Hulkenberg penalty which continues to exploit the inconsistency with F1 ruling where a clear advantage was gained for leaving the track. Notable mention goes to Felipe Massa ending his formula career with a 10th place finish in his final drive with a nice battle vs his long time teammate alonso. Last edited by Mayhem on Mon Nov 27, 2017 9:35 pm, edited 1 time in total. Thanks Mayhem for running the league, and thanks everyone for a great season - in particular the Buzzin' Hornets for giving me such a tight battle throughout most of the season! I can't believe I came so close, and only fell short by 17 points in the end. But at the same time I can't believe I came so close at all, and it still feels kind of incredible to be the world #3 on debut in the Autosport GP Predictor. I am the United States champion and the Planet F1 champion, and those championships will help soothe the fact that I lost every other domestic competition on this forum by miles! Your welcome.... Tied for 2nd in the world , thats an impressive accomplishment. Holy F***!! Did not expect that score in the final round. I thought I would be lucky to stay P3.. I was impressed when I saw it as well - did you actually have Bottas down for the win and pole? Was good fun! Congratrulations on the win and well done to Exediron for pinching second! 2018 season is now OPEN!!! PLEASE CONFIRM YOUR TEAMS IN THE THREAD!! !